Energy healing or healing through touch is practiced in many forms and many cultures. Some people seem to have a natural gift for hands-on healing, with no special training. Reverend Rosalyn Bruyere had the ability first and then studied how to enhance it. She has been studied extensively, too, as she collaborates with scientists in research on healing. Dr. Barbara Brennan started out in atmospheric physics but she found she had a gift for hands-on healing. Both have now created modern systems for training healers. I say modern, but both use the chakra system from Ayurveda and yoga. Traditional medicine in India, China and Japan includes a sort of energy anatomy and concepts of prana, chi, or ki (all meaning life force or energy) as part of the health of the mind-body complex. The Chinese qi gong (or chi kung) and the Japanese Reiki are probably the best known traditional energy healing methods. It may be surprising to think of yoga as a form of energy healing, but it is, and it even has healing hands. I use Uttabodhi Mudra as my image when I comment on other WordPress blogs, and someone may have seen it and wondered about it. What you’re seeing is my hands doing yoga. In addition to being a writer and professor, I’m a yoga teacher. All yoga poses not only move prana through channels in the mind-body complex called nadis, and they also work like antennae to draw prana in. Mudras work the same way. They can be integrated into asanas (poses), practiced in a series for a particular effect, or held during meditation. 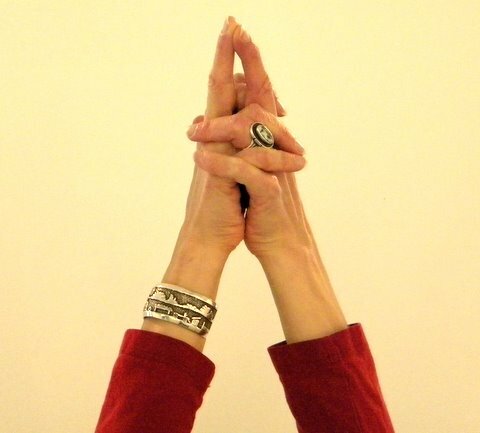 I first realized mudras were powerful medicine in my yoga therapy training. We had an early morning class in mudra practice, and I had not had coffee. Sleep clung to me like cobwebs. Then we did Vajrapradama Mudra. (Spread the hands and fingers, like a “jazz hand” and interlace the fingers right over left, palms facing but not touching the heart.) Suddenly, I was awake. This mudra was like espresso. 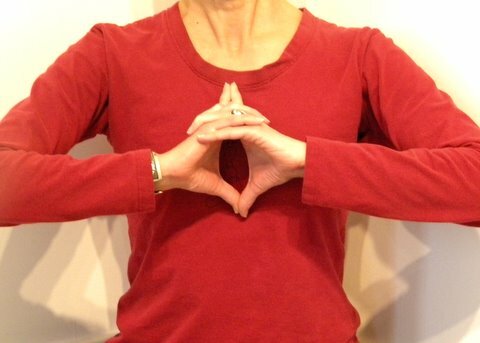 Uttabodhi Mudra (1) balances and energizes the whole body and all of the chakras. Kaleswara Mudra (2) is a strong self-healing mudra, affecting the first, third and fourth chakras, with an emphasis on the fourth—the heart. Its shape looks heart-like. 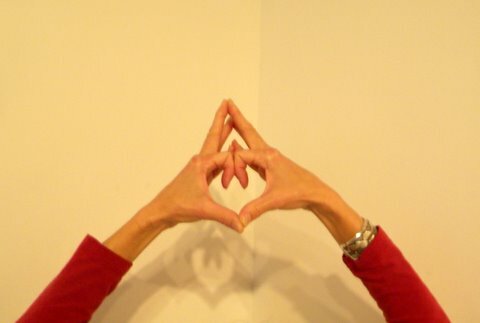 Matangi Mudra (3) revitalizes strength and energy at the third chakra. It can be used to enhance creativity and shake off lethargy. Apana Mudra (4) is grounding— good for letting go and for balancing energy at the root chakra. 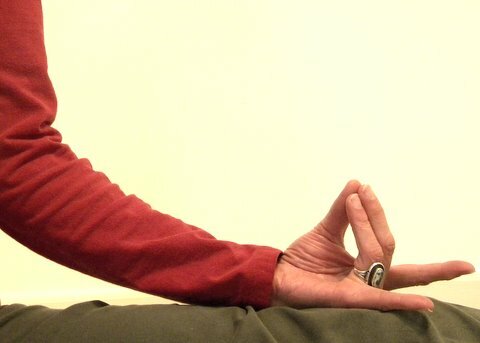 Sometimes in a class where everyone is in a mudra, I see all the hands with my eyes closed. I’m not sure what that means, but it feels blissful. Translations of the Sanskrit: Vajrapradama, unshakeable confidence; Uttabodhi, highest wisdom; Kaleswara, Goddess of time. Matangi , Goddess of inner power. Apana, the downward current. A great resource for this practice is the book Mudras for Healing and Transformation, by Joseph and Lillian LePage. (These are the only two editions I could find.) I studied with the authors and they are wonderful teachers.